A nine-year-old boy was rescued from a church by police in the Nigerian state of Ogun after the child had been chained up for weeks as punishment for allegedly stealing, police said. Police and members of the Nigeria Civil Defence Corps (NSCDC) found the boy at the Celestial Church of Christ in Ajibawo after receiving a tip-off from a concerned neighbor. The child had been chained by the neck to a large log of wood in a room for weeks, police told the Premium Times. Muyiwa Adejobi, spokesperson for the Ogun State Police Command, said the boy’s father, a pastor in the church, was responsible for chaining up his son and is now on the run. The child’s stepmother, who had reportedly accused the boy of stealing and reported him to his father, was arrested. 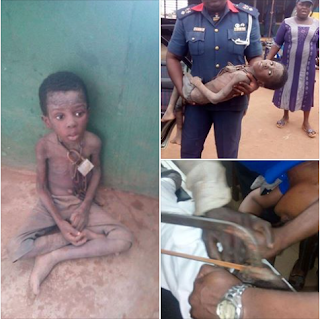 Kareem Olanrewaju of the NSCDC said the boy was punished for repeatedly stealing soup prepared for the family and was chained up for two weeks. The agency also released images showing the efforts to release the child from chains so that he could be administered medical treatment. He added that church members led by the boy’s stepmother had tried to stop officials from rescuing the boy. “The boy was tired and pale, he was not able to talk when he was initially rescued,” Olanrewaju added. The child was taken away by officials and was given food and medical treatment at a hospital and is responding well to treatment, according to the Daily Post.